Mizuna, a Japanese plant from the mustard greens family, is a spiky feathery green leafy vegetable. Your first inclination, if you’ve never tasted it, might be to pass it by simply because of its look. I would encourage you not to this week. If you enjoy a slightly bitter tangy green, then you will like this one. 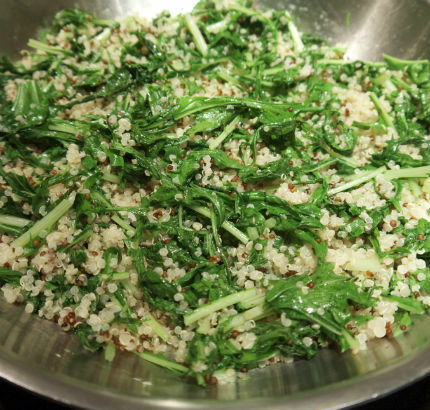 The flavor is somewhere between arugula and frisee – fresh, but not strong. It’s absolutely delicious as a counterpoint to a mild fish like snapper or flounder. 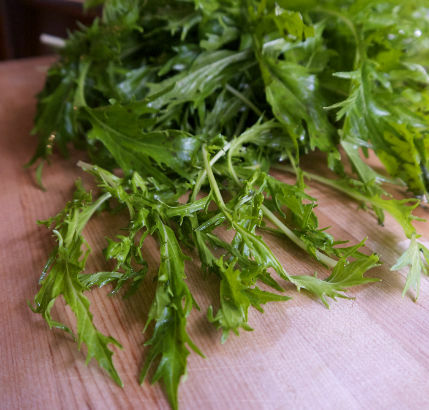 Mizuna is native to China but has been cultivated for centuries in Japan. It can withstand cooler temperatures and at it’s peak in the Fall. Mizuna is high in Vitamins A and C, Iron, B-6 and Calcium; and very low in calories and sodium with zero fat and cholesterol. 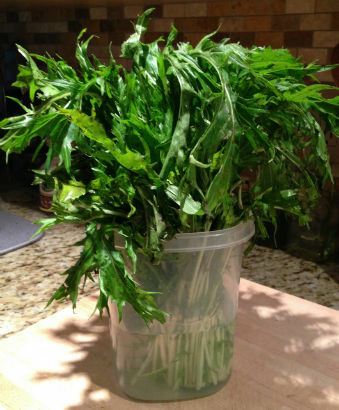 You can eat mizuna raw in salad, sautéed, added to soups or pureed into a pesto. Because it’s small and light, it cooks up in a snap. Simply rough chop the leaves and quickly sauté them in a little olive oil, salt and pepper for about a minute. I am a big quinoa eater, so there is always a bag in my cabinet. It cooks up just like rice, in only about 15 minutes. I did however come across a pre-made organic quinoa product this week at Costco. (Also sold on Amazon.) In a pinch, this is an awesome idea – simply open and use. That is exactly what I did with this salad, along with slicing up a pear. From start to finish this took 15 minutes. Perfect as a side with dinner or with soup for a light lunch. 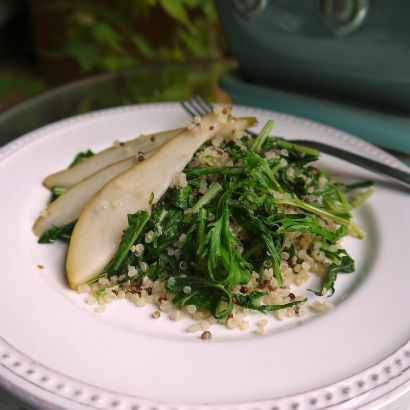 Click this link to see the: Mizuna, Quinoa and Pear Salad recipe. With the weather getting chillier mizuna will only be around for a few more weeks so give it a try before it leaves us until next year. Seasonal Chef will be on the road this week and next making several stops around Westchester: on Friday morning, October 11, I will be visiting my friends at Orlando in the Morning, on WFAS 1230 AM. Check me out in the 8:00 hour. On Saturday the 12th I have a double header: first stop is the Pleasantville Farmers Market where I will be part of a judging panel for their annual Apple Pie Contest at 10:00 am. Anyone can enter and prizes will be awarded. Check out the link above for details. Even if you don’t compete, market-goers will have an opportunity to taste the pies after the contest. So don’t miss out!After the contest I will then zip over to the John Jay Homestead Farm Market and demo from 11:30-1:00 an upcoming dish for my Seasonal Chef recipe and video series. I’ve had the great pleasure of demoing at this market for the past several years, and being a part of their closing day. It’s always a little bittersweet as it marks in my mind the real end of summer (yes, I know technically its been several weeks!) and winter on the horizon. Market Manager Jennifer has many great things planned for closing day and the vendors will be bursting with lots of goodies, so please plan to stop by. On Friday October 18 I will be guest teaching at the Hilltop Hanover Farm & Environmental Center in Yorktown. Click this link for more information on their Couples Cooking Class.